A fight between Big Oil and local residents in Kalamazoo serves as a cautionary tale. After eight years on the Kalamazoo County Parks Commission board, board member and local activist Matt Lechel had never encountered an issue like the one that confronted the board last January: a proposal to drill for oil in one of Kalamazoo's community parks. The proposal came from a representative of Wolverine Gas and Oil, a Michigan corporation that had distinguished itself in 2004 with the largest continental U.S. oil discovery in 30 years. The representative provided handouts for his presentation, which proposed to lease land within Kalamazoo's Scott's Mill County Park for the purpose of drilling for oil. Lechel was flabbergasted that the parks commission was hearing the proposal at all. In 2010, the area suffered the biggest inland oil spill in U.S. history when Enbridge Line 6B burst and flooded the Kalamazoo River Valley. The scars of this disaster run deep in the community, leaving great sensitivity around the intersection of public land and the oil industry. Plus, the noise and upheaval of oil drilling would hurt the public's enjoyment of the space. How, he asked, did an oil rig fit in with that? At least half the board disagreed with him, resulting in a tie vote on the measure. But the following month, the Wolverine representative was back with the same presentation, the same handout and a slightly modified proposal. This time, the company wasn't asking for drilling rights to the park. It just wanted to excavate, using seismic testing, to see if there was oil there. Lechel wondered what was so important about this small parcel of land that Wolverine wouldn't take their initial no for an answer. Why were board members who took public pro-environment stances arguing in favor of the measure? Most of the board saw the proposal as an economic boon. Across the country, similar deals have brought millions of dollars to state and county governments. Along with the five-county Huron-Clinton Metroparks system in southeastern Michigan, Pennsylvania's Allegheny County, North Dakota's Mountrail County and Ohio's Medina and Geauga counties fund local infrastructure by leasing public land. According to Jim Gipson of Chesapeake Energy Corporation, a petroleum and natural gas exploration and production company headquartered in Oklahoma City, "One of our larger royalty owners is the Oklahoma Department of Wildlife Conservation." This despite the 600 percent increase in earthquake tremors over the past 10 years of heavy hydraulic fracturing throughout the state. Back in Kalamazoo, the board voted 7-2 in favor of moving forward with Wolverine’s proposal. In response, Lechel turned to social media, alerting the public of the potential for drilling in their local park. The backlash was so great that a public hearing was held a few days later. To start, Kalamazoo County Commissioner Stephanie Moore provided a statement that the parks commission had no authority to grant a lease to Wolverine and that the county had no intention of considering it. Despite the assurance that there would be no drilling in the park, emotions ran high during the hearing. For an hour and a half, citizens stood up to speak passionately against giving the oil industry access to public space. The parks commission objected to the meeting with Wolverine being publicized. They said Lechel had blown the issue out of proportion, and that they had approved it "in concept only." By making it public, he had compromised their brand. Lechel maintains that this was not his intention; he simply wanted the elected officials on the board to be accountable for their positions on the issue. 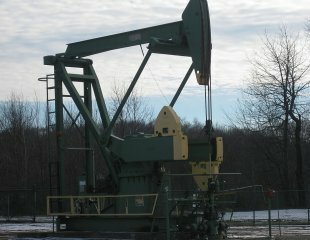 One aspect of accountability is the standing deal between the oil industry and Michigan's administration of public land, known as the Michigan Nature Trust Fund. Michigan is the first, and maybe the only state in the country that receives money from state land oil excavation to protect national resources. As Melissa Molenda, marketing director of the Nature Conservancy's Michigan chapter, proudly explains, "That's how we've protected so many natural lands in Michigan." Lechel says that when asked about the downsides of drilling technology, the Wolverine rep assured the Kalamazoo Parks Commission that there were "virtually none." Richard Bowman, the director of government relations of the Nature Conservancy’s Michigan chapter, agrees, noting, "The fact is that the extraction of oil and gas from under the surface of the earth, for the most part, has no real or very limited impact on environmental function." His statement contradicts evidence that mineral extraction is a hazard to public health, let alone public enjoyment. Faced with a similar proposal in 2012, Colorado's Boulder County Parks Department released a report documenting the impact observed in oil drilling operations existing on public spaces since the late 1990s. Along with short-term impacts such as road damage, noise, dust and impaired aesthetics of the public space, drilling operations compromised the area's soil structure, causing drainage problems and leaving denuded swaths that were soon covered by noxious weeds, as well as disrupting the habitat of prairie dogs. Furthermore, the parks department reported that once operations ceased, the oil companies often failed to follow up on their obligatory reclamation efforts. The fate of local parks seems to depend on the social inclination of local parks boards. Neil Munger, director of Ohio's Wood County Park District, denied an excavation lease proposal from Reserve Energy Exploration in 2014, noting that his board didn't even debate the issue. "As soon as we understood was the exploration was for, we didn't have to go any deeper," he said. "It's not just the danger of any type of contamination, it's also the disturbance to the area that would happen no matter what. We want to leave the natural area natural." It would seem that the same instinct led the Kalamazoo County Commission to reject the Wolverine proposal out of hand. "We want to maintain a healthy, strong environment for everybody," said Moore, the Kalamazoo County Commissioner. "In my opinion, oil drilling is not how we maintain that high standard of quality of life. That's always going to be my position. There were conversations [that] this could generate some revenue for the county parks. I don't buy that argument—not all money is good money, and it doesn’t maintain the highest quality of life for all our residents." Lechel says many individuals at the public hearing said that they were approached by Wolverine for similar leases on their private property. What started as generous offers, they said, later became manipulative, e.g., "We're going to get the lease anyway. If you don't give us access now, you'll have to settle for what you can get." Some said they were harassed so persistently that they threatened to call the police. Others said they were awakened by a seismic testing truck running across the street from their property. Without mapping any actual data, the truck was firing explosives into the ground 100 feet away from one house, creating defining reverberations so violent it rattled the windows. "They said to the parks commission, 'This is the first time Wolverine approached you? They are definitely coming back. They are ruthless.'" Matt Lechel agrees it's unlikely that Wolverine has given up on its interest in Kalamazoo drilling. At the same time, he is encouraged by the response from the community; it was worth whatever contempt he might have earned from his fellow parks commission volunteers. "At the local level, Kalamazoo is going to definitely resist," he said. "Some have said we could use this as an opportunity to think about policies for clean energy. It would be a fight, but we could at least get it out there." Chelsea Batten is a journalist/ghostwriter with a focus on nature, health andoutdoor life. Follow her on Twitter or Instagram at @thechelseagrin.